First and foremost, a headmistress is a teacher with a passion for her subject and an overwhelming desire to spark a similar enthusiasm in her pupils. At heart, I am a Geographer and when given the opportunity to accompany a school geography trip I leap at the chance. Last week I joined the Upper Sixth Geographers on a field trip to Belfast. A city deeply segregated and devastated by the decline in the ship yards in the 1980s, it has undergone a significant transformation brought about by the peace talks. 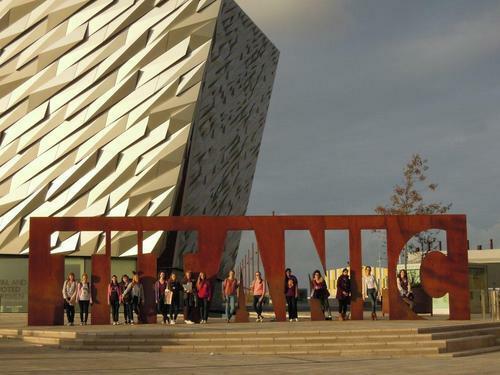 The end of the troubles encouraged large amounts of foreign investment to flow into Belfast revitalising the area with new industries, housing and employment opportunities. The girls’ brief was to look at the regeneration of Belfast, particularly the docks, to see whether the investment had resulted in positive change for the people of Belfast. The girls were struck by the new industries, particularly the award winning Titanic Museum (which I would highly recommend), but they were also very much aware of the religious divide that still defined the city. Religious enclaves were clearly marked by flags that hung on every lamp post, the murals drew people’s attention to the enclave’s particular interpretation of the past and a no man’s land still existed between the two communities, marked by gates on either side. The girls, like me, were taken back by the patriotic demarcation which felt threatening and menacing and wondered how long it would be before the flags were taken down and the communities began to co-exist. Revitalisation was happening in Belfast but communities were still divided. Field trips, I believe, open up the mind to worlds unfamiliar to your own. Seeing and being present in a natural landscape can give you a sense of awe and wonder at its creation, which the Giant’s Causeway seen in the morning certainly did. It also helps to understand the processes that give shape to the world in which we live. The trip to Belfast certainly introduced girls to a world that was unfamiliar to them and gave them, I hope, a greater understanding of how the use of space can provoke conflict. We all agreed the 12 hours spent in Belfast was worth it; I have not stopped thinking about the trip, I am sure the girls are the same.